An overblown musical, Sweet Charity emits occasional sparks but never ignites. 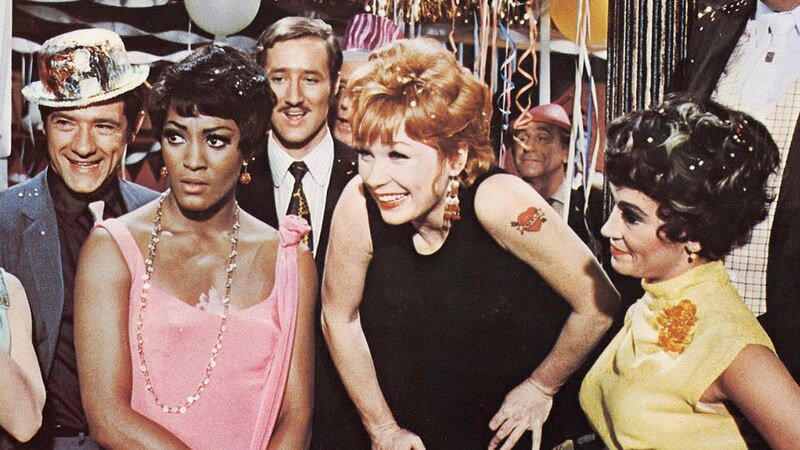 In New York City, Charity Hope Valentine (Shirley MacLaine) is a dance hostess in a sleazy joint along with her friends Nickie (Chita Rivera) and Helene (Paula Kelly). Charity still dreams of finding true love, and after her latest no-good boyfriend literally dumps her into the park lake, she stumbles into a dreamy one-off evening with movie star Vittorio Vitale (Ricardo Montalban). Charity tries and fails to land a respectable office job, but instead finds an unlikely romance with insurance risk assessor Oscar Lindquist (John McMartin) after the pair are stuck together in an elevator. But finding long-term love and happiness will not be an easy quest. The first film directed by Bob Fosse, Sweet Charity is an adaptation of the 1966 stage musical. What works on stage for the most part stumbles on the screen, with the story spread way too thin to occupy the 2 hours and 30 minutes of running time, the songs resoundingly average, and only the better dance numbers providing an occasional lift. The Neil Simon story offers some moments of comedy, but the general sense is of rampant overacting in a bloated production incapable of trimming the fat. The highlights are few but sharp: the dancing girls sing and dance to the seductive (Hey) Big Spender; the entire Rich Man's Frug dance sequence at the Pompeii Club is spectacular; Charity belts out If They Could See Me Now and dances up a storm in Vittorio's pad; then along with Nickie and Helene she performs There's Got To Be Something Better Than This, longing to escape a life of dancing with disgusting neanderthals. But for every good musical interlude there is an equivalent dud, including Sammy Davis Jr. performing a mess of a song as a pseudo preacher, and the owner of the nightclub singing the quite dreadful I Love To Cry At Weddings. Fosse's direction never stops pointing to itself. His favourite childish tricks include zooming into an unfocused shot and zooming out again into a different scene, and the ever handy freeze-frame. The film simply does not carry enough weight or drama to justify stylistic antics, with Charity's fairy tale pursuit of true love beyond juvenile in its simplicity. Shirley MacLaine is game and through sheer energy bulldozes her way through the film, unapologetic in her theatricality and willing Charity along in her naïve quest for any better job and the love of any man. The supporting cast alternates between bland and irritating, John McMartin contributing plenty of nothing to the role of blank insurance risk assessor Oscar. Montalban and Davis cash their cheques for effectively playing themselves. Sweet Charity is a mediocre mix of admirable glitzy dancing, average music, and a mundane, unnecessarily protracted story.